One in three landlords have said they are not ready for the public smoking ban which begins in Wales in a month. Only 69 of the 100 pubs across Wales contacted by BBC Radio Cymru for the snap survey said they were prepared for the new law. The assembly government has launched an advertising campaign to raise awareness that smoking will no longer be allowed in public places from 2 April. It will feature billboard posters and adverts on trains and buses. The survey also found that 45% of landlords were worried about the effect the new law would have on their businesses, while 9% said they would wait and see. Lucy Wigley, who owns the Drovers Arms in Carmarthen, said it would feel "awkward" telling loyal customers they have to go outside to smoke. But she added: "Rules are rules and they state that no-one will be allowed to smoke in a public place. So we will have to make it comfortable for them to smoke outside the pub. "I do not want people to stay at home because I am friends with most of them, so we have to find a way to accommodate them." 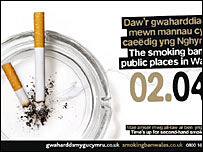 From 2 April, smoking will be banned in enclosed public places and workplaces in Wales - just under three months before it is introduced in England. In preparation, the assembly government is staging its biggest public health campaign to date which will feature a series of radio and television adverts throughout March. Called "time's up for second-hand smoke", the main image is of an ashtray which alludes to a clock face with the cigarettes replacing the hands. Deputy Health Minister John Griffiths said the advertising campaign would reinforce the message that second-hand smoke killed. He added: "I've been delighted at the public response to the decision to introduce the ban. "Smokers and non-smokers alike are embracing the change and some smokers have told me that they think the ban will encourage them to quit." Funding for the All Wales Smoking Cessation Service has been increased by £390,000 in preparation for the expected growth in demand for it once the ban comes into force. "They're all quite happy to go outside for their cigarettes"
The smoking ban is hailed a success but pubs warn of closures. Can the ban help you quit?